For months my family was living and eating on the fly. As we packed up our California home, there was little time to experiment with new recipes - much less cook old ones - but now that we are settled into our new home, everyone is practically begging for something new and exciting for breakfast, lunch, snacks...and especially dinner! Well it was a necessity to come up with some new creations that would satisfy my hungry kids hunger and taste buds! 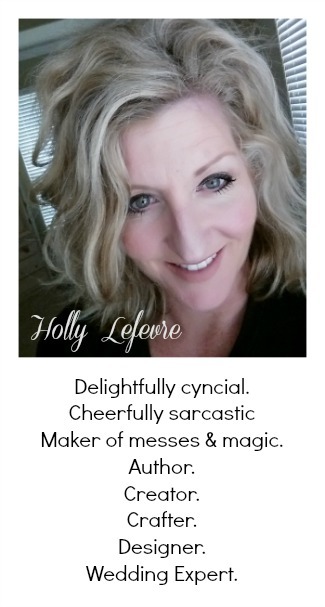 I admit it - I needed a little inspiration to get my creative cooking juices flowing! I headed over to the Campbell's Kitchen to take a look at the amazing recipes. I quickly discovered some very creative ways to use Campbell's Soup in recipes - just what I needed to liven things up in my kitchen. 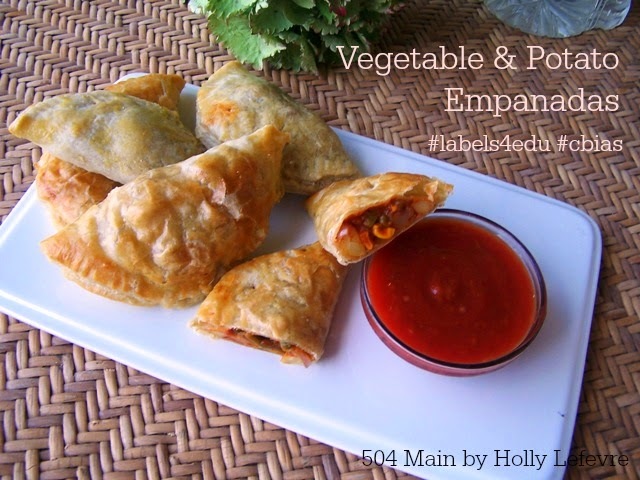 I was immediately drawn to the Latin-Inspired Collection, and decided that I had to try my hand at making empanadas. I miss a lot of things about California - including my grocery stores! So, for this #CollectiveBias shop, I headed to Randall's to purchase my empanada ingredients. Randall's reminds me of home (it is affiliated with the store I used to shop at) plus it has a HUGE selection of everything! 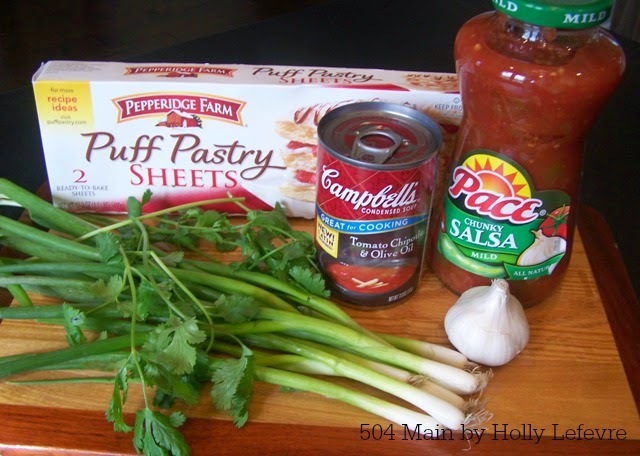 I was able to pick up all of my ingredients - fresh produce, Pepperidge Farm Puff Pastry, veggies, and of course the Campbell's Soup! 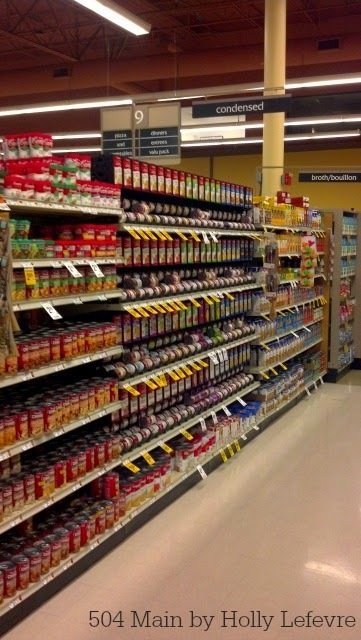 Seriously this is the best soup aisle every...Look at all those Campbell's Soups...and look at all those points to be earned for Labels for Education! 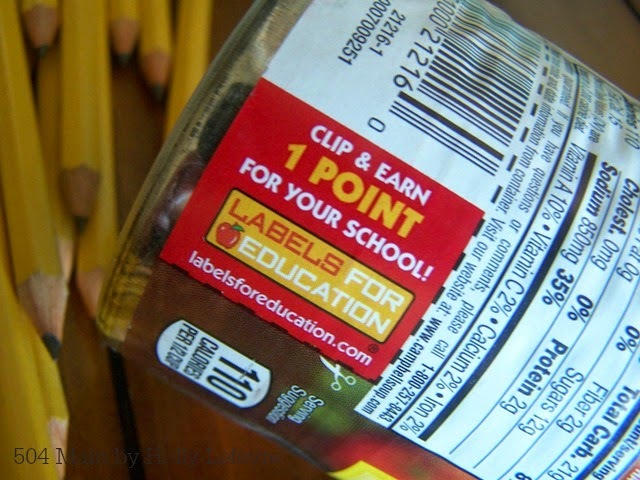 Campbell's Labels for Education Program, and thought that educating others about it was super important. I personally have never heard of a school that said they did not have a wish list of supplies or items for the school year. And...how great it is that by purchasing and clipping the UPC codes on any one of these 2500 participating products you can HELP your school! #Labels4Edu products include everything from puff pastry to dairy products to soup! The Labels for Education website has everything you need to begin this program in your own school. You can even view a school's wish list and track its earning progress! Best yet...it is so easy to get families involved. Just purchase participating products, and clip the UPC labels. Different products have different point values. The condensed soups I used are 1 point each but some products are worth 10 points! After seeing the recipes for Spicy Black Bean Empanadas and Black Bean and Beef Empanadas, I was having a hard tine deciding which one to make. 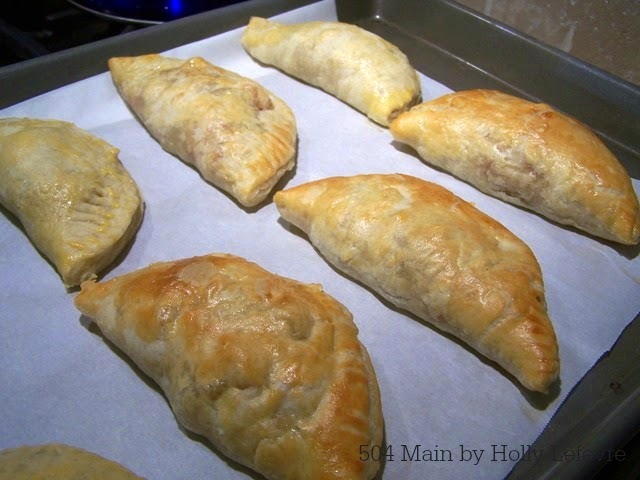 I liked many aspects of each recipe (based on what my family likes), so I used my favorite parts to create a twist on the empanada for my family. 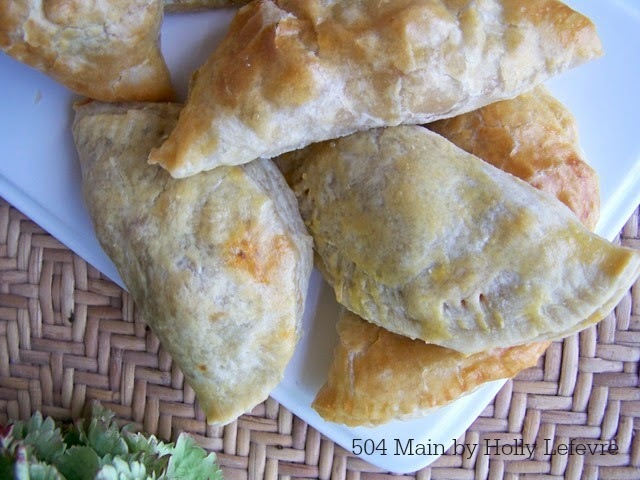 These tasty treats are savory and filling and make great afternoon snacks or a meal! I switched out the beans and spices and added soup (which added all the flavor we needed!) and veggies to make my version vegetarian! Pace Chunky Salas, mild for dipping! Prepare baking sheets by lining them with parchment paper. Place one thawed sheet of puff pastry on a floured surface. Roll out to a 16" x 12" rectangle. Cut 6" circles. I made a template out of parchment paper. NOTE: I was able to get about 20 circles from the puff pastry. If you cut smaller circles, you can yield up to 40 from the puff pastry. Wash and dry the potatoes; prick each one with a fork; microwave for 3 minutes. Place the frozen mixed vegetables in a medium bowl, cover with a paper towel and microwave for 2 minutes (or course you can cook on the stove top - just do not over cook). In a skillet, heat the olive oil; add the garlic; add the onion; cook until slightly caramelized. 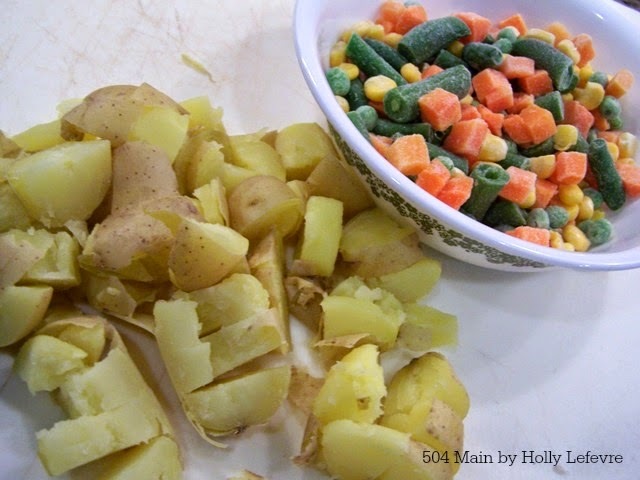 Add the potatoes; add the mixed vegetables; stir together. 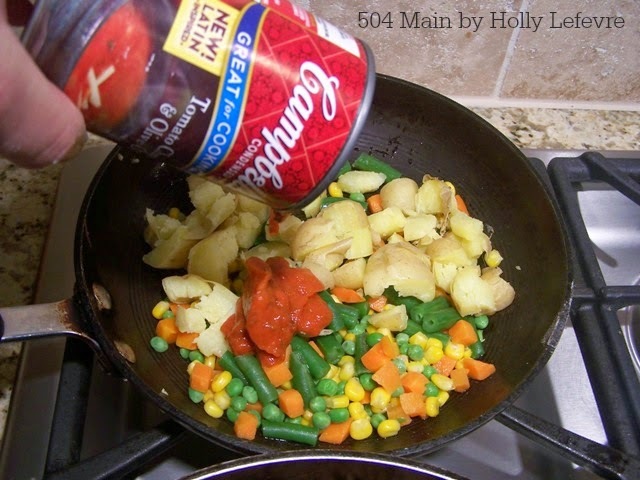 Add the can of Campbell’s® Condensed Tomato, Chipotle & Olive Oil Soup. Stir to combine and simmer for 10-15 minutes. Place the circle of puff pastry on a lightly floured surface (I found it was easier to work with them on a lightly floured surface). 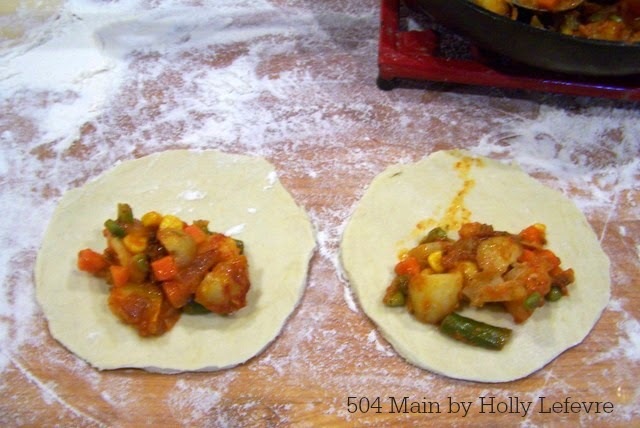 Place about 1 heaping tablespoon of filling on one half of the circle. Wet the outside edge of the dough with some warm water; fold the dough over and press the edges together. Use the end of a fork to crimp the edges together. 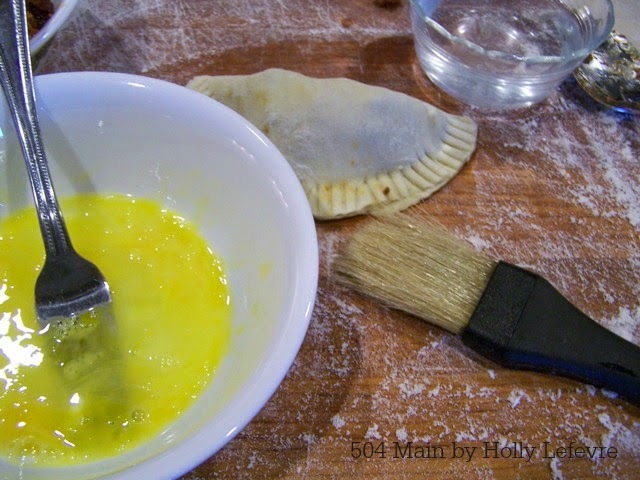 Whisk one egg in a small bowl and apply a light wash over the top of the empanada. 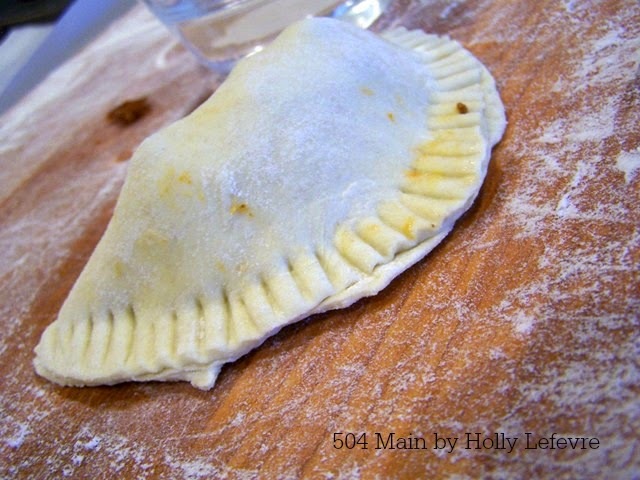 Use a spatula to place the empanada on the lined baking sheet. Continue with filling the circles until your empanadas until complete. Bake at 375 for 15 minutes...or until golden perfection! or as my family preferred Pace Chunky Salsa! 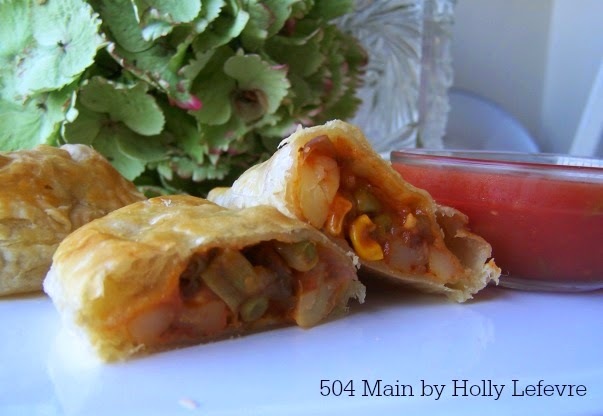 there are so many way to customize the filling to satisfy your family's tastes! Before you head to the store to support your school, be sure to check out the coupons available at Labels for Education too! Labels for Education is running a sweepstakes right now! 1,000 schools will win $1,000 in cash! From now through December 31, 2014 entries can be made via the website and by submitting labels and caps from participating product to your Labels for Education Coordinator. I know my school could use $1,000...what about yours?!!! Enter and get the rules and details here. Have you ever had an empanada? If so, what is your favorite filling? This post is written and created at 504 Main by Holly Lefevre This shop has been compensated by Collective Bias, Inc. and its advertiser. All opinions are mine alone.